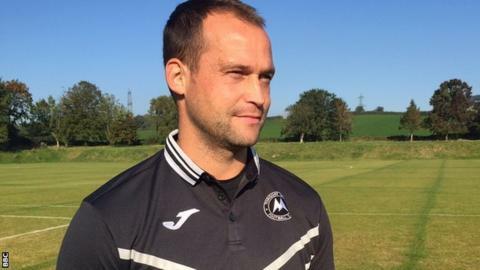 Torquay boss Kevin Nicholson says it will be "strange" to manage the side from the dugout for the first time. Nicholson is cup-tied for Saturday's FA Cup fourth qualifying round game with Basingstoke, having played for Bath City in a previous round. "Right now I'm regretting it as if the lads do well I'll lose my place and have to fight my way back in," he said. The left-back took over as Gulls player-manager last month and has started every game since. "It'll be strange," added Nicholson, who says he will be a calm figure on what will be his first game as a manager from the sidelines. "I've never been a big one for shouting. It's alright when you're on the pitch, but the lads have prepared well so far this week. "Once that is done, stood on the side I wouldn't expect to have to shout, I'd expect them to do it for me." Nicholson scored the last time Torquay won an FA Cup match - a 3-1 win over Chesterfield in the first round in 2011. Prior to that the Gulls had a decent pedigree in the competition, making the fourth round in 2008-09 and 2010-11 and the third round in 2009-10. "Looking back to any of those games means nothing," he told BBC Sport. "All that matters is what we do now, what we've done this week and what we do on Saturday. "I know it's nice for people to look back and reminisce and I've got great memories from it, but it has absolutely zero bearing on what we're about to do, which is prepare and go in the right way to Basingstoke to try and win the game."